Bishop Montgomery’s Justin Bibbins has been maligned most of his basketball life. He’s too short at 5’7 and too small at 150 pounds dripping wet to achieve an measure of success in a game where height is the most significant component. However, after four years as starting point guard at Bishop Montgomery and a senior year as South Bay Player of the Year, John Wooden Player of the Year, All CIF-Southern Section Open Division First Team, there was one more statement to be made. 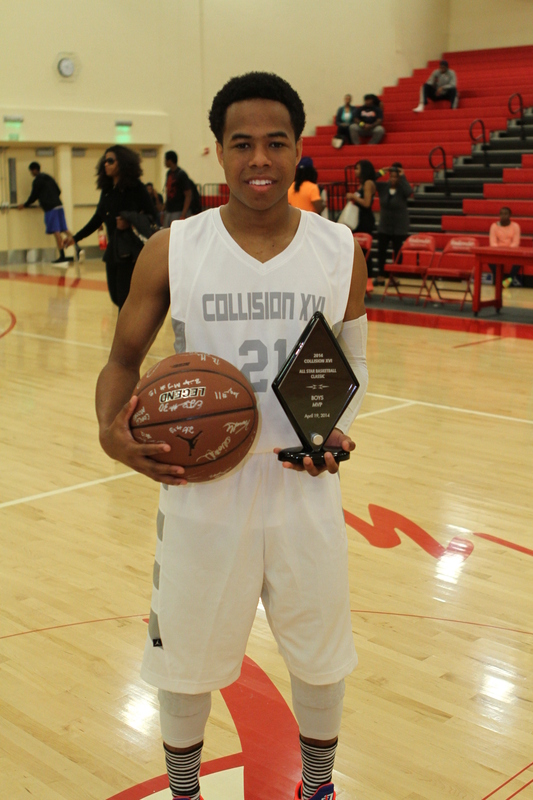 The Collision All-Star Game has created its share of basketball memories over the past 15 years. The 16th annual showcase at Redondo High School on Saturday was no different. The girls game featured a St. Bernard reunion as DeMoria White and Chenelle Pelle teamed up with former teammates Michelle Curry (Culver City) and Cydney Bolton (Serra) to help power the Southern Section to 76-43 win. It set the stage for the boys game a few hours later as Justin Bibbins helped the Southern Section to a 110-86 win that tied the overall series at 8-8. The Southern Section girls lead the series 13-3. White had a game-high 18 points and Curry, named the game’s MVP, finished with 13 points and 13 rebounds. “I missed playing with them so it meant a lot ending our season together,” Curry said. “It feels like a reunion with the family I started with,” White said. Serra’s Caila Hailey also was pleased to share sides with with not just Curry and her St. Bernard rivals but also her coach McKinsey Hadley, who coached the Southern Section girls. The City Section cut the lead to 24-20 late in the first half but the Southern Section responded with a 14-0 run that carried over into the second half. Tatiana Maimot’s layup made it 38-20. White had a four-point play for an 18-point advantage, 43-25. The Southern Section’s size also proved tough as Bishop Montgomery’s Janelle Odionu led a frontcourt that featured players well over six feet. With the City struggling for layups, it settled for jumpers and with Hadley calling for his team to run it soon grew tired trying to keep up with its CIF counterparts. There was small consolation as Narbonne’s Jade Everage was named the Albert “Cap” Lavin Scholar Athlete of the Game for posting a 4.2 grade point average. “To know you’re appreciated for all your hard work and not just playing basketball, it’s really special,” Everage said. The Southern Section boys jumped out to 23-5 lead and never looked back as Bibbins standout had nine points and four assists during the run. The Southern Section led 57-41 at halftime and looked like the more comfortable team throughout the game. “Once we set the tone and got a big lead, we could just play our game,” the Bishop Montgomery standout said. He was named the game’s most valuable player after finishing with 17 points and six assists. Westchester’s Nick Hamilton, who’s never received less than an ‘A’ in high school, received the boys counterpart of the scholar athlete award. “It feels good to be recognized not just for your play on the court but even more for academics,” Hamilton said. Comets teammate Cameron Young led the team with 18 points and Elijah Stewart added 15. It was almost fitting Young would have such a big game, considering Westchester won its last game of the season at Redondo. Saturday also marked the last game at Redondo for Ian Fox and Terrell Carter. Fox gave the crowd one last look at his shooting touch with 14 points, including several three-pointers. “It meant a lot winning my last game at my gym,” he said. Redondo Beach native Thomas Welsh (Loyola) also relished the chance of playing his last prep game in front of family before moving on to UCLA. The McDonald’s All-American had 18 points and seven rebounds as his coach Jamal Adams watched from the bench. “It was a lot of fun, especially finishing with coach Adams,” Welsh said.